Romans Commentary, Introduction | Open Our Eyes, Lord! The epistle to the Romans rises to meet the reader on two levels: (1) as a treasure house of beloved gospel texts; (2) as an ancient missionary letter, written for a specific moment in Paul’s work among the nations. Both levels are valid. Today’s disciple first comes to know Romans because of its neat formulations of, for example, the deadliness of sin (3:23), the free gift of eternal life (6:23), the transformation of the new person in Christ (12:1-2). Beyond that, secondly, we must enter into the mind of Paul and appreciate his plan for the final years of the AD 50s – a missionary journey that would take the gospel farther west from Jerusalem than it had ever gone, across several of what we now call time zones. We then see that Romans, when first delivered, was a clear call to action for the believers in the capital to receive Paul for a time, and later to sponsor his trip to evangelize Spain. In the Americas too, we are arming ourselves to take the gospel to the nations, in particular unreached ones. We too will benefit from knowing, not just what Paul said about salvation, but why he said it to these Christians in Rome, and by extension how it is God’s summons to us to show forth the gospel. Romans was written by the apostle Paul and almost certainly sent from the city of Corinth. While some commentators express doubts over whether the apostle really wrote Ephesians or the Pastoral Epistles, no-one has had any serious misgivings that Paul authored this document, dictating Romans to a Christian named Tertius (16:22), who wrote it down and perhaps polished its style. A Christian woman named Phoebe then took the letter to Rome (see comments on 16:1-2), a sea voyage of 2-3 weeks from Corinth. At one time many believed that parts of Romans 15 or 16 were not part of the original epistle, but that Romans was sewn together from various letters. In that case, the last chapter might have been a short greeting sent to the church of Ephesus. This theory arose in part because it seemed unlikely that Paul could have known so many people in Rome, whereas he had spent years in Ephesus, which also happened to be Priscilla and Aquila’s last known location (cp. 16:3 with Acts 18:26). Secondly, there seem to be too many benedictions and closing remarks for just one letter. However, the tide of opinion turned in the 1970s with the publication of new research, which indicated that Romans as we now have it was always one, integrated document, sent to Rome. Paul wrote Romans near the end of his third journey, while he was spending three months in “Greece” or Achaia (Acts 20:2), which region included the churches in Athens, Corinth, and the port of Cenchrea (see 16:1). He possibly also wrote Galatians around that time. Romans can be dated to AD 58, although some believe that 57 is more accurate. Paul’s writing style reflects his dual upbringing. He had been trained to be a rabbi under the famed Gamaliel I, the very man who counseled the Sanhedrin to have patience with the followers of Jesus (Acts 5:33-40). The rabbi-trainee Sha’ul would have been taught how to study the Law, pass on traditions, and expound a theological position to other rabbis. It is particularly evident in 1:18-3:20 that he could speak in a Jewish manner to other students of Torah, using their own Scriptures to defend the gospel of Jesus. He also seems adept at the Greek language and rhetoric, perhaps gained as a schoolboy at Tarsus. Taken all together, the Christians in Rome may have numbered in the hundreds. The church was really a network of congregations, some meeting in Transtiberum, a poor and disagreeable neighborhood where Jews tended to live; Jewish Christians were probably low on the social and economic scale. Other congregations met in the homes of non-Jews. Among the Christians in Rome, as hints Paul in chapter 14, the gentile believers outnumbered the Jewish ones. Rome had a population of about 1 million, and experts calculate that there were perhaps 50,000 Jewish residents, that is, 5% of the population. We now know where some of the synagogues were, in and around Rome, buildings that were regarded as “houses of prayer” and also centers of instruction in the Law, the Torah. The Christians were a tiny sect in a sea of paganism. They had no neighborhood synagogue buildings nor grandiose temples but met in crowded apartments or in larger private dwellings. Aquila and Priscilla hosted one congregation “that meets in their house” (see 16:3-5); Romans 16 probably alludes to others. Paul knew about 26 of the Roman Christians by name. It is possible that he encountered most of them around the time that Jews were expelled from Rome in AD 49; that’s how he met the exiles Priscilla and Aquila in Corinth (Acts 18:2). Whether they gathered as one unified group to hear the newly-arrived epistle, or whether Phoebe read the scroll from house to house, it was very much an oral experience (see for example Rom 10:17), since most of the people were illiterate. It would take perhaps an hour to read it aloud, plus Phoebe would have been able to answer questions about its content – she had probably been present when Paul dictated it and was anointed by circumstances as the letter’s first expositor. Reading 15:14-33 we see that Paul’s planned itinerary was: Corinth-Jerusalem-Rome-Spain. In fact, what happened is that he was arrested in Jerusalem (Acts 21:33) and by the time he eventually arrived in Rome, it was as a prisoner (Acts 28:14-16); so 2-3 years after writing his epistle he finally connected with the Roman believers. And a short time later the Roman church would confront its greatest trial – when Rome burned in the summer of 64, the emperor Nero put the blame on this tiny sect, leading to fierce persecution and martyrdom. Scholars have put forward various theories as to the basic purpose of this letter. The viewpoint that we will follow here is that Paul wrote to (1) inform the Romans of his future trip to their city and, even more importantly, (2) ask their help for his new missionary initiative and (3) convince them that it was absolutely necessary that Spain hear the gospel, because after all, the whole world needs to hear it. But why go to Spain? Because it was a territory as yet untouched by the gospel, and Paul was called to be a pioneer: “it has always been my ambition to preach the gospel where Christ was not known, so that I would not be building on someone else’s foundation” (15:20). If the hearer or the reader of Romans does not sense this urgency, perhaps he or she does not understand the gospel, since it tells us that our relatives, neighbors, fellow citizens, or the inhabitants “unto the ends of the earth” must hear and receive it, or else confront the wrath and anger of God toward those who do not obey the gospel (2:8). That’s why Paul is going to demonstrate that “it is the power of God that brings salvation to everyone who believes: first to the Jew, then to the Gentile” or Greek (1:16), and thus for that reason every believer ought to be an activist in the work of evangelism. And so, the epistle to the Romans is missiological, designed to enroll the Romans – and by extension, us – in the work of the gospel. We have other examples of this in Paul’s writings, for example Philippians 4:15-16, “Moreover, as you Philippians know, in the early days of your acquaintance with the gospel, when I set out from Macedonia, not one church shared with me in the matter of giving and receiving, except you only; for even when I was in Thessalonica, you sent me aid more than once when I was in need.” And with respect to Thessalonica, Paul asked them in 2 Thessalonians 3:1-2, “As for other matters, brothers and sisters, pray for us that the message of the Lord may spread rapidly and be honored, just as it was with you. And pray that we may be delivered from wicked and evil people, for not everyone has faith.” Paul was seeking for support, both spiritual and economic, from the Roman church. Calvin, John, Romans, Calvin’s Commentaries 19, Eerdmans, Grand Rapids, 1979. The reader may access this volume at http://www.ccel.org/ccel/calvin/calcom38.html. Cevallos, Juan Carlos y Rubén O. Zorzoli, eds., Romanos, Comentario Bíblico Mundo Hispano 19, Mundo Hispano, El Paso, 1999. Cranfield, C. E. B., Epistle to the Romans, ICC, 2 vols., 2nd ed., T. & T. Clark, Edinburgh, 2004. The reader may prefer to use the abbreviated version, Romans: a shorter commentary, Eerdmans, Grand Rapids, 1985. Dunn, J. D. G., Romans, Word Biblical Commentary 38A-B, Nelson, Nashville, 1988. Hendriksen, William, Romans: New Testament Commentary, 2 vols., Baker, Grand Rapids, 1980. Jewett, Robert, Romans: A Commentary, Hermeneia, Augsburg Fortress, Minneapolis, 2006. Käsemann, Ernst, Commentary on Romans, Eerdmans, Grand Rapids, 1980. Keener, Craig S., The IVP Bible Background Commentary: New Testament, 2nd ed., IVP, Downers Grove, 2014. Ladd, George E., A Theology of the New Testament, rev. ed., Eerdmans, Grand Rapids, 1993. Moo, Douglas J., Romans, NICNT, Eerdmans, Grand Rapids, 1996. Stott, John, The Message of Romans, IVP, Downers Grove, 2001. Wesley, John, Wesley’s Notes on the Bible, Zondervan, Grand Rapids, 1987. The reader may access this volume at https://www.biblestudytools.com/commentaries/wesleys-explanatory-notes/romans/. Wilckens, Ulrich, La carta a los Romanos, Biblioteca de Estudios Bíblicos 62, 2 vols., Sígueme, Salamanca, 1992. 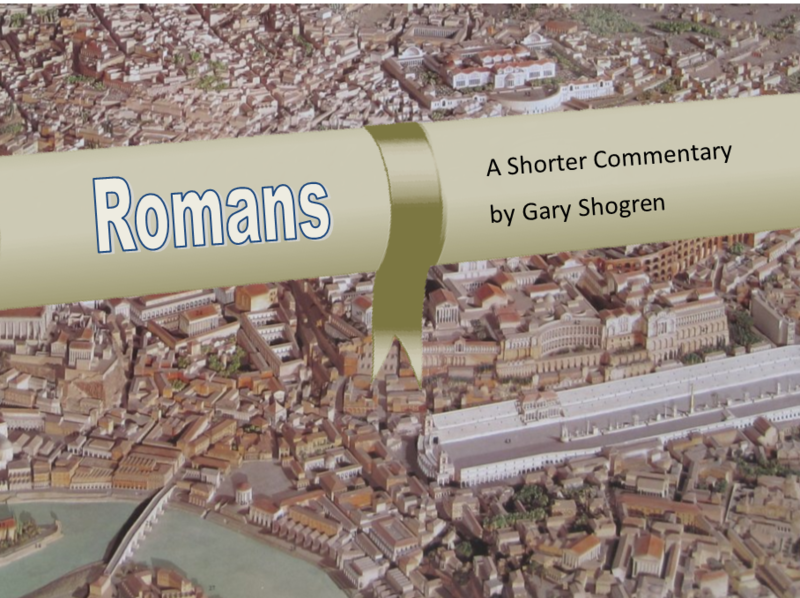 What three or four commentaries have you found most helpful in your study of Romans? Hey David, the next section will have the brief bibliography.